APQC published its recent Metric of the Month examining the number of budget versions before final approval. It discusses ways organizations organize their budgeting practices to minimize the number of versions needed to get one that is finally ready to send forward for Board approval. When evaluating the key metrics for finance organizations, tracking the number of budget versions has always perplexed me. As shown in the metric results, top performers generate 4 budget versions (while median performance is 5 versions/ bottom performers at 8). While the number of budget revisions is typically considered to be an efficiency measure, I have always considered it to be a quality measure. When you look at it that way, any revision after the first submission is a form of rework. So if “Best” performers start at 4 versions, that means they have 3 revisions. And if “Best” performers exhibit this type of rework, I can only imagine how challenging it is for the bottom performers at 8 or more. From a quality perspective: Why is it acceptable to have top performers exhibiting three rounds of rework? 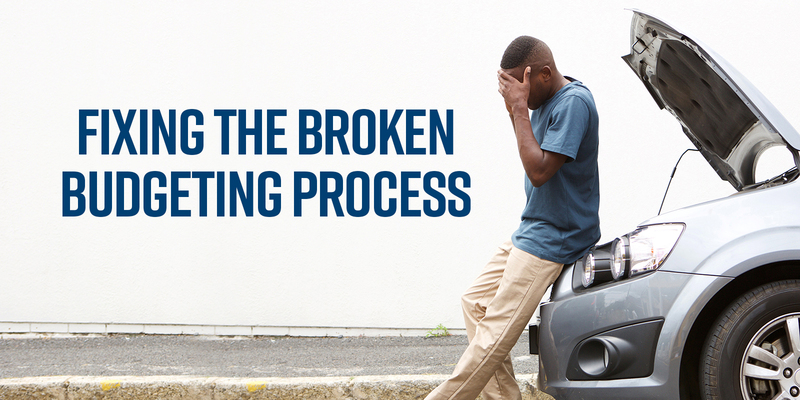 It is time that finance leaders recognize that budgeting processes are severely broken. While they call often for “better budgeting”, I would submit that the problems are much deeper – no amount of trying harder and doing better will fix these problems. Why? Because budgeting, as currently practiced as a process, is “not fit for purpose.” The only thing that will fix it is to dramatically change the process. When you examine these, even the most casual observer can begin to identify major conflicts of interests in these objectives. Managers are likely to propose targets that can be easily reached to ensure that their team receives full bonuses. Yet corporate managers often seek aspirational goals to stretch teams to reach higher. The result is one key driver of budget revisions which is the back and forth negotiation. And that negotiation is the opposite of aspirational – it is seeking the lowest acceptable target. Another major cause of budget revisions is that fact that budgets are based on hundreds of assumptions, both big and small. Any plan of expected future performance includes assumptions (explicitly or implicitly) about the general economy, the interest rate environment, changes in key materials and other supply chain costs including the cost of personnel, changes in competitor actions that may require response, and changes in key customers. Because budgets embed so many assumptions, their usefulness as planning documents begins to erode as soon as they are approved. How do managers protect themselves and their teams? By hiding as many budgets cushions as they can. Many budget revisions are simply the back and forth negotiations of what cushions will be allowed to remain. This process is complicated by the fact that managers often hide their budget cushions. The slang term for these is “cookie jars.” You do not want corporate to find your cookie jars or they will eliminate all your cookies. Before anyone takes offense, it is important to note that these managers making budget submissions are merely following a budget process required by the design of the process. In their mind they are merely being prudent and protecting against the inherent uncertainty that the process fails to consider. Most have been promoted up the corporate ladder because they have become proficient in playing these budget games. It should come as no surprise that managers become good at what the system requires them to do to win and be rewarded. The problem comes when the flaws in this same system become exposed, and the system no longer functions effectively (which is what is happening with traditional budgeting practices). That’s when it becomes time to change. Ask yourself whether you would expect to be successful if you ran a manufacturing enterprise or a medical facility using 1920s tools? Because budgeting, as typically practiced, follows the same basic approach as when it was first moved to wide spread use. When we count the number of budget revisions, we are merely reminding ourselves of how unfit budgets are. It my personal opinion that budgeting is a huge part of the “DUMB STUFF” finance should stop doing. Target setting should shift out to a mid-term target (3-5 years) based on your strategic plan. This provides strategic direction but eliminates the negative activity of targets being a stopping point. Evaluations of actual results are best done by league table comparisons. You can easily start with the local organization’s departmental personal best. From there, the evaluations can compare peer groups to identify the organizations best performers and how to share their approaches across the entire group. Then comparisons to the competition can be added to see how you are doing in the commercial marketplace. When you are achieving top marks there you can move up to world class benchmarks (This is definitely an area where APQC can help). Incentive bonuses can be paid on actual results compared to how well peer organizations did in the same environment. This will dramatically reduce the arguments over expected future conditions, as performance is only judged against what actually happened and how well you competed. Forecasting is much easier, as it merely tries to state what is expected to happen. If that differs from the trajectory of your targets, then revised action plans are needed but the forecast stays the same. Many organizations have already eliminated their budgets. These include American Express, Equinor (formerly Statoil), HOLT CAT, Maersk, Marshfield Clinic, ThedaCare and Unilever. Let us know if we can help you make the change.